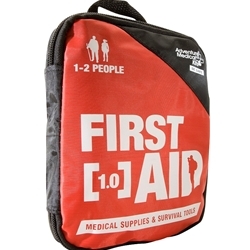 The Adventure First Aid 1.0 contains supplies to treat cuts & scrapes, sprains, insect bites, headaches, muscle aches, and allergic reactions. AMK's exclusive Easy Care™ First Aid System organizes items by injury with injury-specific instruction cards to help anyone quickly and confidently give first aid. With supplies organized into injury-specific pockets, anyone can give fast and effective first aid. Wide elastic bandage plus instant cold pack. A wide array of medications to treat pain, inflammation, and common allergies. Coated nylon outer bag with waterproof plastic inner bags. Size: 5" x 6.5" x 1"
Adventure Medical Kits President Chris Gubera breaks down the Adventure First Aid 1.0, a mid-sized kit for low-risk activities with enough supplies for the whole family.